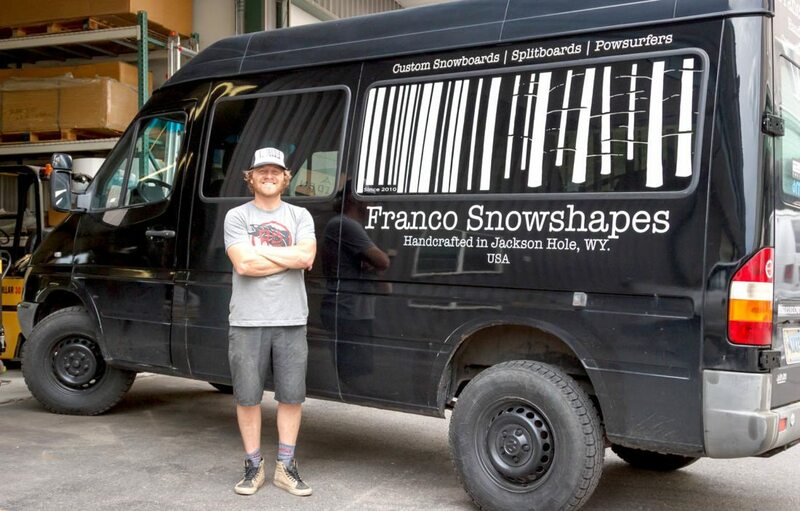 Altoona native Mikey Franco poses beside a hauling vehicle bearing the logo of his custom-made snowboard company, Franco Snowshapes, in Jackson Hole, Wyo. After suffering a back injury, Franco decided to transition into a business that would allow him to continue snowboarding. Mikey Franco is living his dream. “I read an article about Jackson Hole when I was 16 or 17 and immediately knew that was where I was going to be some day. I went to Jackson Hole for spring break, and that was it,” Franco said during a visit home to Altoona in April. Franco graduated from Altoona Area High School in 1988, and in 1990, after one year at Penn State Altoona, he moved to Jackson, Wyo., to teach snowboarding and has been there ever since. “I got a full-time job teaching at Jackson Hole Mountain Resort. I’ve spent 28 years at the same place. I don’t do it as much now, but it is a unique part of my business,” Franco said. Franco, 48, grew up along Broad Avenue and 24th Street and remembers skateboarding at Kid’s Mountain while growing up. He first rode a snowboard in 1984. He started his snowboarding teaching career at Tussey Mountain Ski Resort near Boalsburg in 1989. In addition to teaching snowboarding, Franco became a guide at the resort in 2000. “My primary responsibility was to take people out of the resort and into the brush country. You had to be a skilled skier or snowboarder to go on the tour. I am still doing that today on a part-time basis. It is an integral part of the business,” Franco said. In 2010, Franco got into the snowboard manufacturing business working with Parris — who also had moved to Jackson and who had taken over Igneous Skis. Franco also was working for Burton Snowboards, the world’s largest snowboard maker. He was suffering from a back injury and couldn’t ride but went to Japan and China to train instructors. While in Japan, he met Taro Tomai, the founder of Gentemstick snowboards. “He made the most beautiful snowboards I had ever seen. I was really blown away. My inspiration was the Japanese snowboards,” Franco said. “Having been injured, I realized if I am hurt, I can’t make money. I needed something else. I had to look at my future. I transitioned into a business that allowed me to stay in snowboarding,” Franco said. In 2014, Franco opened Franco Snowshapes, his snowboard manufacturing company. Franco’s snowboards are custom made. “They are built after personal consultations. It is like a tailored suit. They are tailored or fitted to my customers from their head to their feet,” Franco said. Franco’s custom-made snowboards cost $1,800 to $3,500, more than a typical snowboard. “Ours have a sidewall which protects the edge above the steel. We do a single piece of wood which wraps around the entire snowboard through steam bending. Our sides are steam bent; our sidewalls are unique. No one in the world has done them. They are gorgeous,” Franco said. Franco said his small business is growing. “Last year, we made 50. This year, we expect to make 75. They are all individually fitted. Each one we start from scratch. The next year, we will break 100 easily,” Franco said. As a snowboard instructor, Franco has had the opportunity to meet some celebrities. “I met Blake Mycoskie, founder of Tom’s Shoes. I taught Harrison Ford to snowboard at least 10 years ago at Jackson Hole. I also taught Sandra Bullock, Christina Ricci and King Hussein’s son Hashim,” Franco said. Franco is well known in the Jackson Hole community. “Mikey is kind of a celebrity out here. In a lot of ways, he is a mentor to many people who look up to him. He is great at what he does. He is a very driven guy. If you would have asked him what he would do when he grew up, it was to make snowboards, creating something that he knows more about than most people. He is creating snowboards and sharing the love with everybody,” said Jerret Mater, a Lewistown native and longtime friend who worked with Franco at Tussey Mountain before also moving to Jackson. “He was one of the first snowboarders in the Jackson Hole area. He was here when it all started. He has done a bit of everything — teaching and now building snowboards. His legacy is he has trained about every snowboard instructor in the valley. The last year or so, his company really took off. It is the talk of the industry. Many publications have raved about his snowboards,” said Matt Floyd, snowboard school supervisor at Jackson Hole Mountain Resort, who has known Franco for 17 years. Anna Olson, president/CEO of the Jackson Hole Chamber of Commerce, has known Franco for 21 years. She worked in marketing at the resort when Franco was head of the snowboard school in the mid 1990s. Franco said he only gets back to Altoona about two times a year. While home in April, he picked up some wood from his brother Joe. “My brother had some ash trees he cut down, and I can use them for snowboards. We cut them down, milled them and took then to a kiln to dry them. This will provide me with enough wood to make 75 snowboards,” Franco said. He calls his father Alex his role model. “His work ethic has got me to where I am now,” Franco said. High school friend Rich Aveni of Altoona calls Franco a true gentleman. “He is old school as far as his values. He is just a good person. Anything good that happens to him in life, he deserves it. I have not heard one bad thing said about him,” Aveni said. Jason Pellegrini, who worked with Franco at Tussey Mountain and now lives in Jackson, called Franco outgoing and humble. “He always talks about his roots in Altoona. Anytime anyone brings Yuengling Lager back to Wyoming it is a good moment for him,” Pellegrini said. Alan Sipes, who was assistant soccer coach at Altoona Area High School, said Franco was a great kid. “He was very polite, a great athlete, always upbeat. He could play any position and play it extremely well,” Sipes said. 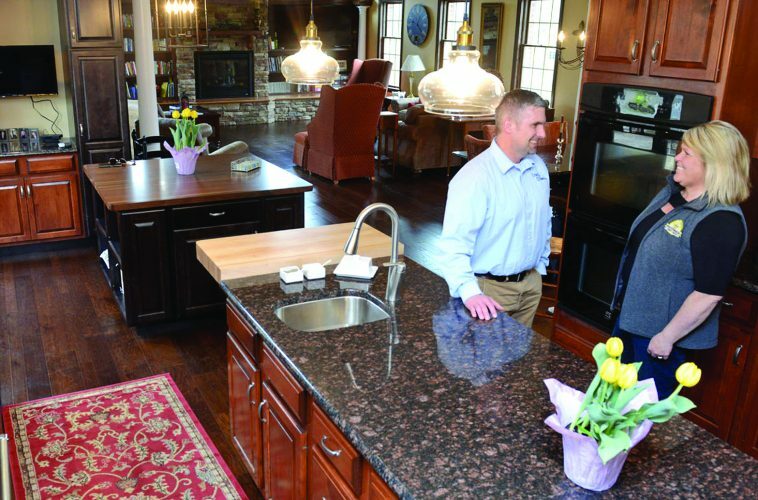 Franco is optimistic that his manufacturing business will continue to grow. “What is great is that snowboarding is maturing, which is important. A handful of years ago, the New York Times predicted the demise of snowboarding. Snowboarding is our lives. We are seeing a resurgence since the recession,” Franco said. “As long as it keeps snowing and the economy keeps doing well, there is no reason I would ever quit snowboarding. I am passionate about it,” Franco said. His friends are not surprised by his success. “He was always the type of kid who was driven and not afraid to work hard. He worked hard as an athlete and in the classroom. That is the type of guy he is. You like him as soon as you talk to him. He comes from a great family,” Sipes said.